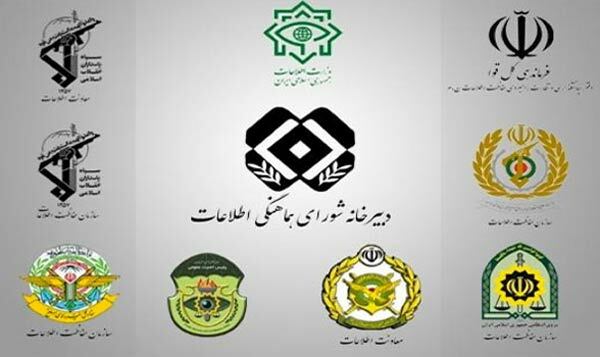 A few days after the publication of a special booklet by the ministry of intelligence, Fars news agency which is closely associated with Iran’s intelligence services announced for the first time the existence of 16 intelligence-security agencies in the Islamic republic. According to the news report, the central of the country’s intelligence community remains the Ministry of Intelligence while the Revolutionary Guards Intelligence Unit, the Military Intelligence Unit, the Police Intelligence Unit and the Intelligence Security Unit of the Revolutionary Guards are the key intelligence services in the country. Fars did not name which specific agencies had been created in the last two decades and did not name the others either. But the report did provide some description about the “Intelligence Coordination Council” which was created by virtue of article two of the law that created the ministry of intelligence for the purpose of coordinating the activities of the various intelligence services. According to this law, the intelligence coordinating council would have nine members comprising the minister of intelligence, the attorney general, the Director of the Revolutionary Guards Force Intelligence Security, the Director of the Revolutionary Guards Force Intelligence, the Director of Military Intelligence Security, the Director of Military Intelligence, the Director of Police Intelligence Security, or his fully authorized representative, and the minister of foreign affairs or his fully authorized representative. According to the Asre Iran author, the contents of the report speak of a more secure agency than the one in the past. The report of Fars and that of the ministry of intelligence are published at a time when just a few months ago Ali Yunesi, the intelligence minister in Khatami’s administration who is now a special assistant to Hassan Rouhani, had announced that intelligence minister Mahmoud Alavi had yet to take full control of his ministry. Hardline principlists have on a number of occasions called for changing the ministry of intelligence into a simple agency, arguing that the body should be under the direct supervision of the country’s top leader ayatollah Khamenei. It has been reported that under Mohammad Khatami’s first administration, Ghorbanali Dori Najafabadi who was Khatami’s first intelligence minister and who ultimately resigned because of the exposure of the serial murders committed by agents of his ministry, was Khatami’s 16 choice for the minister of intelligence and the fifteen higher choices had all be rejected by ayatollah Khamenei. Ahmadinejad of course objected to this interference and refrained from working for eleven days, which resulted in a change in his relationship with ayatollah Khamenei and a faction within the principlist group that was the backbone of his support. Mahmoud Alavi was Hassan Rouhani’s choice to lead the ministry of intelligence. Some Majlis representatives objected to him during his Majlis confirmation voting. Since his tenure, he has failed to win the support of some Rouhani supporters while some authorities have even openly complained about his performance. Ali Yunesi, the minister of intelligence during Khatami’s administration has at least on two occasions said that Alavi had yet to fully take control of the ministry of intelligence. It appears that this is the reason why Alavi is strongly pushing the idea of activating the intelligence council. He has said from the first days of his appointment that he is serious about convening the sessions of the intelligence council.